The TTRT-03 S2 is Amperis’ third generation, microprocessor-based, automatic, three phase, and transformer turns-ratio tester. 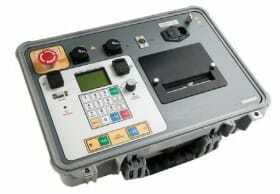 This lightweight and rugged portable unit is designed for transformer testing at utility power substations. The TTRT-03 S2 determines the transformer turns-ratio using the IEEE C57.12.90 measurement method. The TTRT-03 S2 outputs an excitation test voltage to the transformer’s primary windings. The induced secondary voltage is sensed and the transformer turns-ratio is calculated. The TTRT-03 S2 can measure turns-ratios from 0.8 to 15,000. The transformer turns-ratio, excitation current, and phase-angle readings are displayed on the large backlit LCD. The built-in transformer type detection feature allows the TTRT-03 S2 to detect and test 130 transformer types defined by ANSI, CEI/IEC and Australian standards. The TTRT-03 S2 can be used as a standalone unit or can be computer-controlled. It can be operated locally using its alpha-numeric keypad and rotary switch. Information is displayed on a back-lit LCD screen (128 x 64 pixels) that is viewable in both bright sunlight and low-light levels. Test reports can be printed in the field on the unit’s built-in 4.5-inch wide thermal printer. The TTRT-03 S2 is capable of storing up to 112 test records and 128 test plans in Flash EEPROM memory. Test records or test plans can be stored or transferred to and from a PC via the available interfaces (RS-232C port, USB port, USB Flash drive port). 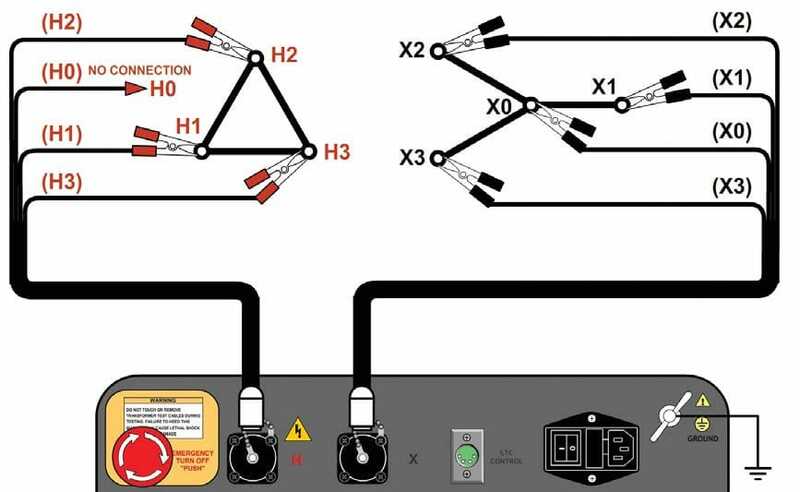 To prevent an accidental wrong test-lead hookup (e.g., when the operator reverses H and X leads), the TTRT-03 S2 outputs a low-level test voltage to verify the hook-up condition before applying the full test voltage to the transformer. Three test voltages (8 Vac, 40 Vac, 100 Vac) allow the TTRT-03 S2 to test CT’s and PT’s, as well as power transformers. The TTRT-03 S2 can automatically detect 130 specific vector groups for different transformer types defined by ANSI, CEI/IEC, and Australian standards. Up to 112 test records can be stored in the TTRT- 03 S2’s Flash EEPROM memory. Each test record may contain up to 99 turns-ratio, excitation current, phase angle and nameplate voltage readings. Test records can be recalled locally or transferred to a PC via the available interfaces (RS-232C port, USB port, USB Flash drive port). The TTRT-03 S2 features a convenient built-in 4.5-inch wide thermal printer that can be used to print test results. The TTRT-03 S2 can store up to 128 transformer test-plans in its Flash EEPROM. A test-plan is comprised of the transformer nameplate voltages for each tap setting. The calculated turns ratio based on the nameplate voltages is compared with the measured turns-ratio to derive the percentage error and Pass/Fail results. By using a test plan, a transformer can be quickly tested and turns-ratio Pass/Fail reports can be reviewed. Test plans can be created with the PC software and can be transferred to the TTRT-03 S2 via the available interfaces (RS-232C port, USB port, USB Flash drive port). The TTRT-03 S2 features a back-lit LCD screen (128 x 64 pixels) that is viewable in both bright sunlight and low-light levels. 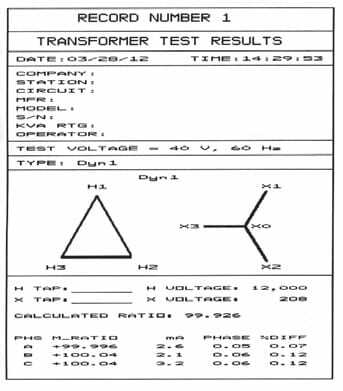 The test results screen displays the transformer turns-ratio, excitation current, phase angle, and percentage error. The unit is controlled via a rugged, 16-key, membrane keypad and a digital rotary switch. A built-in USB Flash drive interface provides a convenient method for transferring test plans and test records to or from a USB Flash drive. The user can store up to 999 transformer test plans and test records on a USB Flash drive, and the supplied PC software can be used to view the test records. In computer-controlled mode, the unit can be controlled via the RS-232C or USB interface using the supplied PC software (Transformer Turns-Ratio Analyzer application provided with each TTRT-03 S2). This Windows®-based application can be used to run tests and to store test results on a PC. Test results can also be exported to Excel, PDF, and XML formats for further analysis. The TTRT-03 S2 can be powered from a single phase 100-240 Vac 50/60 Hz power source. A built-in safety ground detection circuit can detect and display a ground fault problem with the AC input source. Voltage regulator or LTC tap positions can be changed remotely using the unit’s built-in transformer load tap changer. This feature eliminates the need to manually raise or lower tap positions from the transformer control panel. Can store 112 transformer test records internally. Each record holds the test record header and up to 99 readings. Do you want to buy high quality Transformers testing? Inquire for our Transformers testing prices.